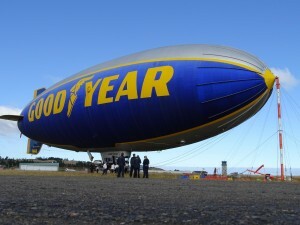 The “Spirit of Innovation” Goodyear Blimp possesses two Pusher engines, each of which delivers 210 horsepower that allow a maximum speed of 80 kilometres per hour. As part of a North American summer tour the Goodyear Blimp returned to Canadian airspace in July, successfully touching down at the Abbotsford Airport after a few weather delays. The visit to B.C.’s Lower Mainland by the Spirit of Innovation GZ-20A blimp was part of a continuing initiative by Goodyear to reinforce its brand with Canadian consumers. During the blimp’s week-long stay, Goodyear customers and members of the press were able to enjoy the once-in-a-lifetime experience of flying aboard the world famous airship. The first Goodyear Blimp was launched in 1925 and since then Goodyear has generally owned and operated dozens of non-rigid airships (blimps) of various types in its global public relations fleet. In 2011, Goodyear announced that it would replace its fleet of blimps with semi-rigid Zeppelin NT airships. Introduced in 2014, the Zeppelin is larger, faster and more maneuverable than the venerable GZ-20A blimp it will replace. Once the Spirit of Innovation blimp retires in 2017, Goodyear’s new semi-rigid airships will, technically, not be blimps at all.